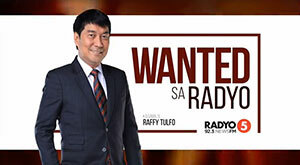 This is the December 5, 2018 (Wednesday) edition of Wanted sa Radyo with the tagline “Kakampi ng mga Inaapi” is a public affairs program that airs every weekdays (Mondays to Fridays) at 2:00 PM to 4:00 PM (PHI time). Ms. Marivic Nabong seeks help to rescue her three nieces from their father. She went to the show of Wanted sa Radyo in behalf of her sister who is an OFW in Dubai. Mr. Renato Flor who works as a security guard seeks help to take his 15-days salary from his employer (New Queenbee Security Services). Ms. Ruby Rose Villanueva or also known as Mystica seeks help to obtain justice from her basher in social media. Ms. Elizabeth Esguerra is complaining her live-in partner for betrayal. Mr. Arnel Traya is complaining his wife who works as an OFW in Malaysia for having an affair with another man.